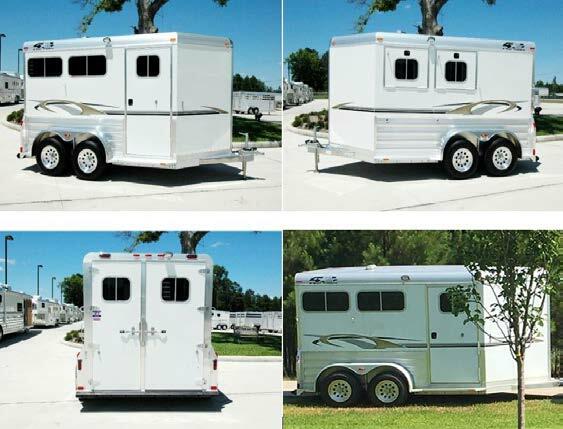 Sometime between August 17, 2018 and August 21, 2018, the pictured 2006 Four Star Horse Trailer, was stolen from a storage lot on FM 1774, in Magnolia, Texas. The trailer is a two stall, white in color 12’ long horse trailer. There is a small dent on the front left panel and has a sun faded circular shaped sticker on the back right door that says “EVENTER”. If anyone has information on the whereabouts of the trailer or suspect information, please contact Montgomery County Sheriff’s Office at 936-760-5800 or Crime Stoppers at 1-800-392-STOP (7867) and refer to case#18A238030.